Ok, I will admit that I got the idea for this post from another blog….I don’t remember the blog, just that they did a post about ouija boards when they were a kid. This reminded me about the time at school when our R.E. Teacher (Religious Eductation) decided to cave to the constant questioning from us all about the beyond and ghosts etc. Let’s face it, there probably aren’t that many kids of 12 or 13 that are genuinely interested in religion….well, there certainly wasn’t at our school. 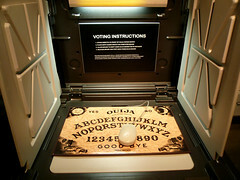 So, in honour of halloween, she caved and agreed to setup a Ouija board to dispel the myth once and for all. In return, we all faithfully promised to listen and pay attention to the rest of the classes she would deliver. I am sure, with hindsight, she realises that it wasn’t a great idea and could never really end well. If I recall though, she was quite new to teaching and keen to impress. I think that was her biggest downfall. Taking advantage of her willingness to go the extra mile, we persuaded her to allow us to dress the room up for the event…including the table that would ultimately be used for the demonstration…..of nothing according to her. So the windows were duly blacked out, various halloween type ornaments adorned the doors/windows and hung off every available surface and, crucially, a large black curtain covered the table with stars and moons crudely marked upon it. The Ouija board was duly placed on top and I made sure that the object to be used for “channelling the spirits” was predominantly metal. At lunch, I snuck in to the room and placed a seriously powerful magnet under the table that I stole from the Science department. A quick test revealed that I could move the object around with relative ease and almost no noise from under the table. 10 minutes later with an incredibly dull light and some chalk, I had pretty successfully recreated the Ouija board on the underneath of the table. The plan was hatched and was easy to carry out….I stayed under the table where I couldn’t be seen and when the teacher called out my name…one of my friends responded for me. The room was dark and eery, so noone was really sure anyway. Then came the time of the Ouija board….a few people put their hands on the object and I let them do all the build up and everything…and did nothing. So they tried again…nothing. I think I let them try a few times and as soon as the teacher started to talk about how she was right etc, I chose that moment to move the object. I couldn’t have planned it better though, I had waited until noone had their hands on it. After the screaming subsided (mainly the girls and the teacher, but a couple of lads too), some of my mates started asking questions about who the ghost was etc.. I duly answered, very slowly of course. Everyone freaked out and in the ensuing panic, when the teacher was turning the lights on and tearing down the window blackout stuff…..and most of the class were legging it outside…I calmly removed the magnet and ran out with the rest of the class. I honestly don’t know if the teacher got in trouble for it, certainly she was still teaching long after I left. I also can’t be sure how many people were scarred for life by the experience. All I know is that my mates and I had a bloody great laugh, got out of a seriously boring lesson early and scared the bejesus out of loads of or classmates. Good times. Irresponsible and mentally disturbing times….but good nevertheless. What nefarious schemes have you lot cooked up? This entry was posted in Back In Time and tagged faux pas, honesty, kids, wtf by Dave. Bookmark the permalink.